The KETTLER Flipper Bike Seat is a safe and secure way to transport your child on a bike. KETTLERs exclusive mounting bracket is the heart of the Natural Suspension System. 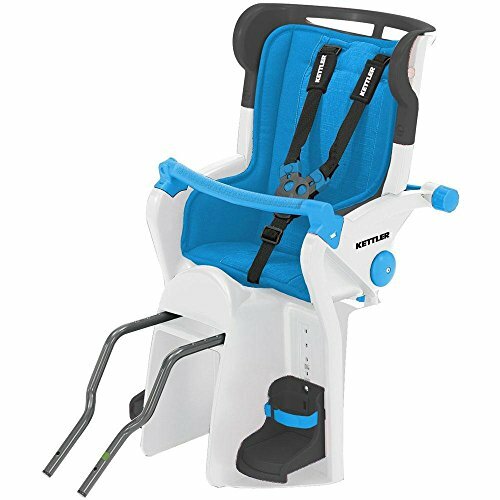 The innovative mounting of the Flipper eliminates frame-mounted racks which cause the transfer of all road vibration from the connection point at the rear axle directly to the child's body. The universal mount fits virtually any bicycle and allows the removal of the child seat with one simple push pin. The Flipper has a height adjustable wrap-around headrest and footrests with fasteners that allow the bicycle seat to grow with any child while keeping them safe. The Flipper also features integrated locking storage compartments that carry all the necessities. Safety features of the Flipper include a 3 point safety harness with Double Lock Buckle and spoke guards to protect small wandering hands. The KETTLER Flipper safely holds a child up to 50 pound.